Bromford Iron & Steel, has announced the latest wave of continued improvements in its facility at West Bromwich. 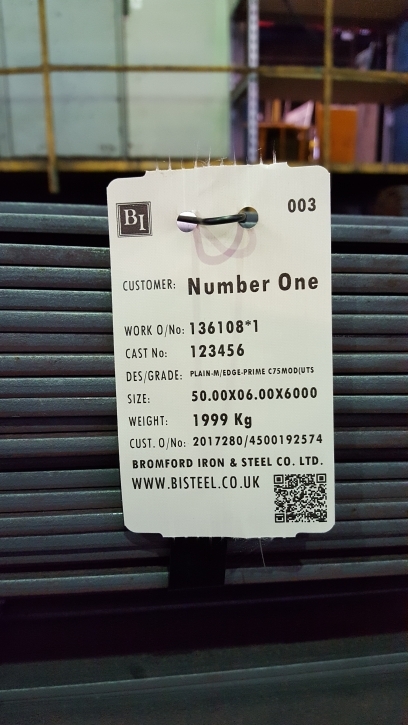 On the 70thanniversary of its incorporation, Bromford, a Midlands-based steel specialist has invested over £12,000 in new labelling technology that offers bar coding capabilities and customised printing on heat-resistant fabric labels to accelerate the movement and processing of finished bars and sections. Using the latest technology, Bromford is able to now offer fabric labels that ensure the right identification information travels with their products. This means faster processes at goods inwards for customers and complete traceability. Part of the OSSL Group, Bromford Iron & Steel has undergone radical development since its acquisition by the Group in 2014. This investment is part of a decade-long commitment that has already seen new apprentices, image-measuring technology and a new condition monitoring system within the Bromford mill.